Every guy needs a black tie. The Solid Black Tie is slightly slimmer than your average tie, giving a trendy edge to all your formal outfits. Every guy needs a black tie. 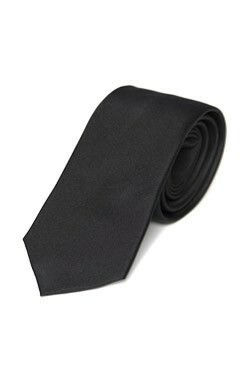 The Solid Black Tie is slightly slimmer than your average tie, giving a trendy edge to all your formal outfits. Made of 100% silk, this slim (width 2.75 inches) tie has a slight sheen that adds an extra touch of elegance to a wool suit.